Some softening of the light is called for, but adding diffusion can decrease output and make the source harder to control. In fact, earlier generations of LED fixtures lacked the lumen output to afford much diffusion. However, technological advances in LED electronics, and the design of certain light modifiers known as Soft Boxes now make them an essential combination. 1) A large source is perceived as the most natural looking light, and a Soft Box generally expands the surface area of the source. 2) The separation between the diffusion material and the source created by the Soft Boxes lessens the light loss by filling a larger surface area with light and also by not wasting stray light. Instead, this otherwise unused light is amplified via the silver reflective lining that makes up the inner walls of the Soft Box. 3) At the same time, the Soft Box helps control spill and with the addition of grids, which attach easily to the outside of the diffusion, the light can be channeled to work where it should, and be eliminated from areas where it shouldnt. 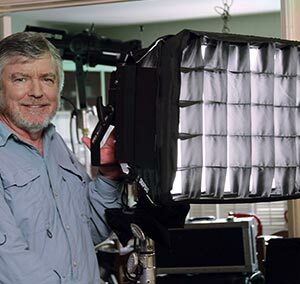 4) Attaching a Soft Box directly to the fixture reduces clutter on the set by avoiding extra stands that might otherwise be required to hold diffusion frames and various cutters thus speeding set up and breakdown. 5) If a white rectangular reflection is picked up in the background, it can more easily be taken for a natural source, like a window, as opposed to seeing the bald spectral points of LEDs flashing camera.